Bitcoin has made some extremely bullish and positive moves every since February 2019. One of the most positive moves has actually come off of the big drop that occurred on February 24th when Bitcoin dropped from 4188 down to 3718. The most recent major swing low occurred a couple of days later on the 27th of February with a low of 3655. Ever since then, Bitcoin has moved higher and has retraced roughly 70% of that selloff. There have been some very predictable and historically important price levels that have both supported and resisted Bitcoin’s price. The first major support that Bitcoin found was at the January 2019 open of 3692. Then, it faces resistance against the December 2018 opening price at 3944. That December 2018 open has been the most recent support level over the past week and has held. Price has formed what is called a Bullish Pennant – a triangle pattern that is a very common continuation pattern. Flags and pennants (bullish or bearish) have a very high positive expectancy rate for working out as a continuation pattern. The trendlines that are drawn show Bitcoin’s price has moved higher and above the upper trend line. But there is one piece of resistance that is probably not shown on a majority of charts. The green arc on the chart represents a powerful 0.618 Fibonacci arc in the current Gann Square geometry. That particular arc is both the strongest support and resistance that price will encounter. While the 4,000 value area is important, it is more important for Bitcoin to move above the arc – which is at the 4020 value area. How probable is this move? Very probable. One of the first things I look for when an instrument is trading at or near an important breakout level is another technical indicator. On my charts, I use the RSI (Relative Strength Index) as well as the Composite Index, created by Constance Brown. Both of these oscillators measure momentum – but the Composite Index measures the momentum of the RSI, which allows divergences that the RSI is unable to catch be caught by the Composite Index. When reviewing the current values of the RSI and the Composite Index, we can observe that they are sitting in fairly neutral territory. This means that any breakout higher has a very good probability of maintaining that move. The predicted resistance level after the breakout is the prior January 2019 high of 4188, which is also near the January 2019 high of 4114. It is likely that price would spike up to one of those value areas before finding resistance. As it happens, the highest value of the 0.618 Fibonacci arc is the exact same level as the January 2019 high of 4114. 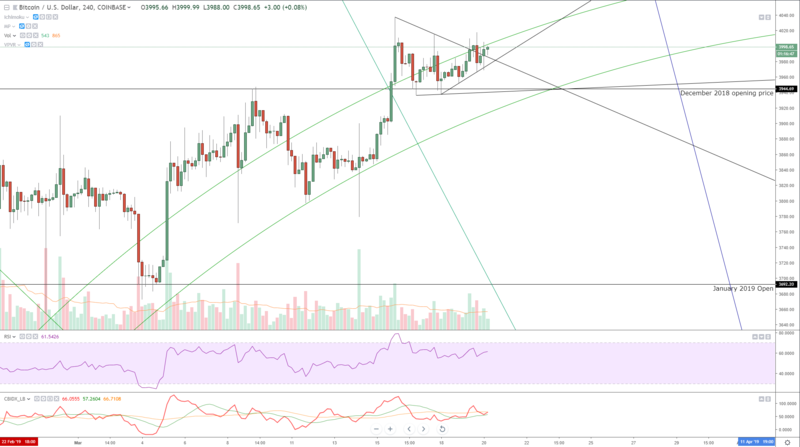 Bitcoin will likely contract and create another bullish pennant formation that could create an extremely tight trading range that would go from March 20th, 2019 to the highest point of the 0.618 Fibonacci arc on April 11th, 2019.